Dumore is the world's leading manufacturer of emergency starter solenoids or battery contactors for fire pump diesel engines. Emergency starter solenoids for fire pump diesel engines start the diesel engine powering the fire pump that supplies water to the fire protection systems in a fire situation when the electronic start fails, as required in Factory Mutual (FM) compliant installations. 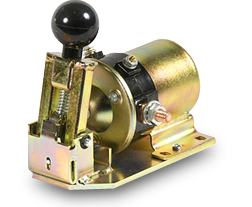 Dumore emergency starter solenoids are available in 12 and 24 VDC models, rated for 400 amps rolling current and 800 amps breakaway current, and suitable for use as a replacement for Metron Type 1804A fire pump engine starter solenoids.